Portland’s Vera Mysteria and a cast of many of Portland’s most creative performers recently launched the successful Black Lodge Burlesque: A Night of Cabaret Inspired by David Lynch at Portland’s Star Theatre. The show was a hit- and rumor has it there may be another installment at some point this spring. The Northwest has a special kinship with all things Lynch; cult hit Twin Peaks was set in a fictional Washington town with exterior shots filmed mostly in Snoqualmie and around North Bend. Perhaps an ambitious Seattle producer should do a little cultural exchanging and bring a Seattle-Portland-David-Lynch hybrid to Seattle this spring, as well…? 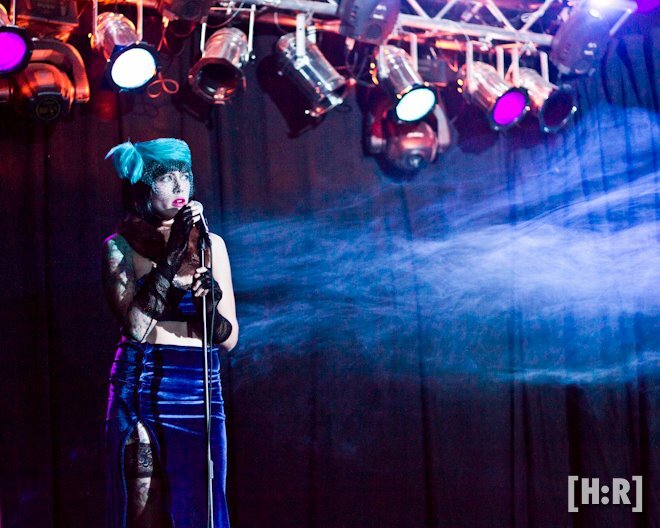 Portland’s Happy Robot Photography generously shared some images from Black Lodge with Burlesque Seattle Press. (Check out more from the show and Happy Robot’s Facebook gallery HERE). In other interesting Portland news, burlesque performer Baby Le’Strange (who stripped from Blue Velvet‘s Dorothy Vallens into the inhalant-crazed Frank Booth) recently spoke at Pacific University in Forest Grove, Oregon on a panel on burlesque as a form of adult entertainment. Baby was joined by a domme, a current and an ex-stripper, and a Sociologist. About fifty students and faculty sat in on the panel. 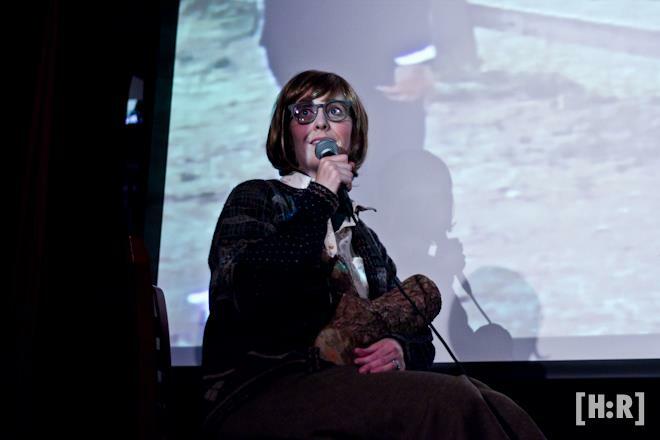 Seattle performer and producer Randi Rascal also has a penchant for unusual themes in burlesque. Randi and co-producer/performer Heidi Von Haught are diligently planning the third That’s F*cked Up, which was just announced for February 10-12 at ReBar. But more on that in a moment. Burlesque Seattle Press: Hi Randi! What have you been up to lately? Randi: Since the glitter-whirlwind that was BHOF I’ve been trying very hard to create a period of rest during the holiday season. I have, however, failed. Hard. I was on the programming committee for BurlyCon which, though a labor of love, is a lot of labor! I went to Burning Man. I produced the Reproduction! fundraiser for NARAL Pro-Choice Washington and performed at various other gigs, including traveling to Portland for the Geeklesque show, which got my whistle wet for more touring. Right now I’m striving to minimize my commitments so I’ll have the energy for the big projects coming up next year. I hear dates for That’s F*cked Up 3 were just announced, plus you’re working on the Neo-Burlesque Road Show…can you tell me anything about these events? So much exciting stuff is coming around the bend! Literally! Heidi Von Haught and I have just nailed down the dates for TFU3: Feb 10, 11, and 12. We are happy to be returning to the perfect venue for these sort of shenanigans: ReBar. The cast will include both amazing outtatowners–we’ll be welcoming Juicy D. Light from Oakland’s Rubinesque Burlesque and have invited back the incomparable Sabrina Chap- and epic Seattle luminaries, including Waxie Moon and Armitage Shanks. I’m also thrilled to announce SpeedBump: A Neo-Burlesque Road Trip will be touring in late February! Luminous Pariah, Paris Original, Wiggy Stardust and I will be taking our show on the road, bringing a sample platter of the latest waves in burlesque innovation to the Western half of the U.S. We’re setting up collaborations with local boundary-smashing performers to showcase the performance art side of our beloved medium. I’m humbly overjoyed to be embarking on this phase of my burlesque career with such talented artists. What have you been inspired by/obsessed with in your own life these days? Lately I’ve had my nose in Debt: The First 5000 Years, by David Graeber. It’s a fascinating read; I highly recommend it. My background is in Anthropology and I’ve always been fascinated with the idea of cultural norm creation- how we decide what behavior is “right” and why. My intense interest in the financial crisis- which is what brought me to Graeber’s book–and what it means for our culture, is rooted in this. I feel that it is symptomatic of our underlying points of cultural dissonance. Our mass hypocrisies. Ironically, I am infinitely grateful to those hypocrisies, because they are the reason for my art. It is! I’ve wanted to pose for them for the longest time and I’m so thrilled to be doing so. I don’t think it’ll be too weird to just hold a pose, but I’ve heard from other performers that it’s much harder than it looks! I’m planning on doing some contortion-y poses though, so I guess I’d better make sure I’m good and warmed up! For more information on That’s F*cked Up 3 (including auditions and proposals), click HERE. ~ by angrytruffle on 11/21/2011.